With a total surface area of 2,030 square miles, Lake Nasser is one of the largest man-made lakes in the world. Created as a result of the Aswan High Dam project, it spans the border between Egypt and Sudan, where it is known locally as Lake Nubia. It produces much of Egypt’s hydroelectricity and is a valuable source of fresh water. For tourists, dramatic desert scenery, abundant ancient sights and legendary fishing opportunities all add to the appeal of a Lake Nasser cruise. Lake Nasser is named after former Egyptian president Gamal Abdel Nasser, under whose instruction the Aswan High Dam was built. The dam, which was completed in 1970, caused the flooding that created Lake Nasser and impounds the lake at its northern end. Although the Aswan High Dam increased Egypt’s hydroelectric power exponentially and enabled authorities to control the Nile’s annual floodwaters so that the arable lands to the north of the dam could be maintained, its construction was controversial. The creation of Lake Nasser required the relocation of some 90,000 Egyptian and Sudanese nomads; while several ancient sites (including the world-famous Abu Simbel temples) had to be moved to higher ground at great expense. Some, like the ancient settlement of Buhen, were excavated and then left to be submerged. Today the dam’s productivity is threatened by the ongoing construction of the Grand Ethiopian Renaissance Dam, located on the Ethiopia/Sudan border. Experts fear that the newer dam may impact waterflow into Lake Nasser, therefore reducing the Aswan High Dam’s electrical output. For many visitors to Lake Nasser, the ancient sites located on its shores are its biggest attraction. Of these, the most famous is undoubtedly Abu Simbel, whose vast rock-cut temples were built by Ramesses II and feature colossal statues that are the largest to survive from the pharaonic era. 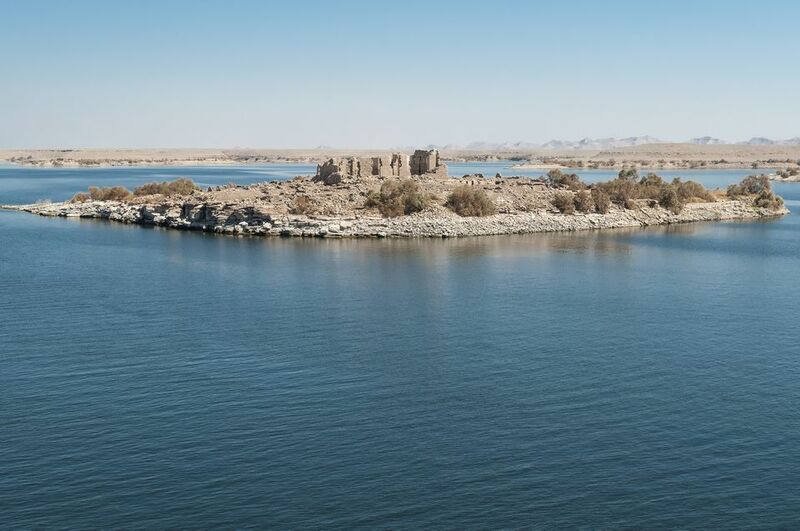 Other highlights include Kalabsha Temple, relocated to an island just south of the Aswan High Dam; and Qasr Ibrim, a settlement whose origins date back to as early as the 8th century BC. The former is interesting for its combination of Egyptian and Roman iconography, while the latter is the only archaeological site at Lake Nasser still in its original location. Although it’s located just north of the Aswan High Dam, Philae is another incredibly worthwhile site. Reconstructed before the flooding on Agilkia Island, the complex includes several temples of which the most famous is the Temple of Isis. Philae rose to prominence during the Ptolomaic Dynasty, was dedicated to the cult of the goddess Isis and is known as one of the last bastions of the old religion. The sound-and-light show at Philae is one of the best in Egypt and should not be missed. There is more to Lake Nasser than its ancient past. Its length and depth allow resident fish species to grow to unprecedented sizes, making it a place of pilgrimage for serious fishermen. For most, a Nile perch is the ultimate prize (indeed, the current all-tackle world record Nile perch was caught here). Other bucket list fish species include the massive vundu catfish and the ferocious, big-fighting tigerfish. You can fish from shore or from a boat, with several operators offering dedicated multi-day fishing trips. Hiking excursions into the desert around the lake give you the opportunity to visit Bedouin nomad camps and to keep an eye out for Lake Nasser’s resident wildlife. Top spots include desert foxes, dorcas gazelles, jackals and the near-threatened striped hyena. The lake itself is also home to Egypt’s last remaining population of Nile crocodiles. Keen birders will appreciate the lake’s status as an important wintering area for migrating Palearctic waterbirds, with as many as 200,000 birds present in peak season. It’s also the country’s only known breeding site for the rare African skimmer. The traditional way to experience Lake Nasser is on a cruise, with most ships departing either from Aswan or Abu Simbel and taking several days to complete the journey between the two. There are several different options, ranging from luxury cruise ships like the 5-star Steigenberger Omar El Khayam to private charters offered by companies like Lake Nasser Experience. The former give you the comfort of air-conditioning, a swimming pool, gourmet restaurants and beautiful cabins with private balconies; while the latter allow you to explore the lake at your own pace, stopping to focus on the things that interest you most. If you prefer not to live on the water, there are a handful of hotels situated on the lake shore, most of them near Abu Simbel. The Seti Hotel and Nefertari Abu Simbel Hotel are two 4-star options, both with lake views, a restaurant, swimming pool and rooms with Wi-Fi and air-conditioning.